While I was catching up on my Twitter feed today I saw the word READATHON and had to see what it was about. I love challenging myself to read a certain number of books or pages or types, etc. Anyway, this one has a fun feature that I haven't seen before - community interaction. 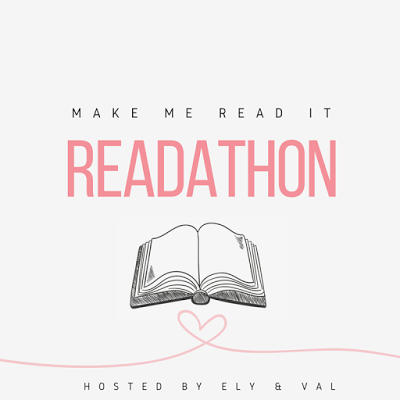 In addition to connecting readers, this readathon also encourages people to read the books that have been on their TBR piles for a long time. You can read about the readathon on Val's post here. You'll also register your participation on this post as well. If you decide to participate, you have about a month to get your books figured out and your poll created so people can start voting. Basically, you get to decide what I'll read during the readathon week - July 9th to the 16th. I need you to vote on the books you think I should read during the week. The books that receive the most votes will be the ones I'll read. The one with the most votes will be the first book I'll read. The book in second place will be the second book and so on and so forth until the week ends. I plan to read at least 3 books during the week. You can vote for up to 3 books, but if you really want me to read it you can come back every day and vote for another three. So let’s see how this goes shall we? I can't wait to see what you want me to read.